With fun knob climbing up a gray waterstreak, Shagadelic is the longer and better-protected version of Golfer’s Route. It is perfectly positioned in the middle of Medlicott Dome, with the spectacular buttress of the Wailing Wall and The Yawn to one side, and a view all the way to Half Dome on the other. 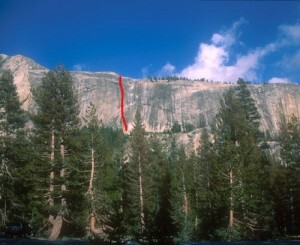 While very well protected by Tuolumne standards, it is not a sport climb. Be careful, especially at the start of the fourth pitch where a tricky horizontal .3-.4” cam placement is the only protection for the first 40 feet. Which SuperTopo guidebooks include a topo for Shagadelic?